Todays 925 streamline shows the border of the "active " monsoon south of the 20N line. There is a high pressure just above the line, indicating the "anti monsoon" pattern. Southwards, low , just inland off Goa is seen. Now, this is what we will be watching in the next few days. Many models confirm vehemently of a "good" system, maybe becoming a cyclone off the Goa coast. That's why I still hang on to the monsoon persisting south of 20N including Maharashtra regions. In fact, I have always mentioned an isolated thunderstorm in Maharashtra, till the actual withdrawal, . Mahableshwar had a thundershower yesterday ( 21st, 22mms), and Pune had 10 mms. Mumbai had its evening thundershower ( which I have been waiting for since the last few days), on Monday. The skies started getting dark in the late afternoon, as the upper parts of the thunderhead ( anvils) started spreading from the east. Day was hot at 32c and night an unpleasant 27c. But the rain at Colaba and S'cruz was just 2.1 mm and 1.6 mm. Not much of a boosting to the seasonal total. Mumbai, continues with the chance of a thundershower popping up in the evenings. But things will change either way, once the predicted system forms off Goa. 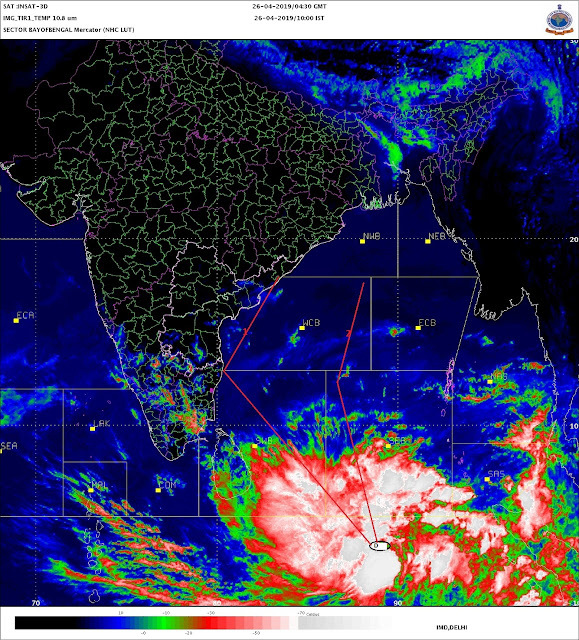 Jim, in his blog mentions if it too late in the season now for a cyclone in the Arabian Sea. Or, if it would be uncommon to have one now. No Jim. I dont think so. IMD, on its site sys, I reproduce :"Cyclones do not form in Arabian sea during the months of January, February and March and are rare in April, July, August and September. They generally form in southeast Arabian Sea and adjoining central Arabian Sea in the months of May, October, November and December." In fact, there have been a number of occasions when a deep depression or a cyclone has formed in the Arabian Sea in Oct/Nov or even in Dec.
2008 - oct - DD, 2004 - sept - severe cyclone, 2004 - cyclone Agni, 2001 - 24th.sept -severe cyclone, 2001 - cyclone, 1998 - cyclone crossed Guj. on 17 oct, 1998 - dec - severe cyclone. Just a few notings of Sept/Oct period from the last few years. Meanwhile the heat in the post monsoon regions has now risen, and Bikaner and Jaisalmer in Rajasthan were 43c yestreday. It's been raining and thundering in Mumbai for the past 3 days. What do the next 3 - 4 days hold? A specail para. on Mumbai in my blog of 22nd. mentions it, and,i would continue to think on the same lines. Wait for the formation, and see the strenght of the low off the Goa coast.